Home Blog General What is Impetigo in Dogs? Does it look like your puppy is starting to enter into his teen years and struggling with a bad case of acne? Most humans have been there and dealt with that, but your dog could be facing something slightly more serious than a few pesky pimples. Your dog might be dealing with an infection called impetigo. Impetigo is a skin infection in dogs caused by the bacteria Staphylococcus, more commonly referred to as a Staph infection. Impetigo in dogs primarily impacts puppies and therefore is also known as puppy impetigo, puppy pyoderma, and juvenile pustular dermatitis. Although impetigo is not life threatening, it is an infection that needs to be treated in order to alleviate any unnecessary discomfort for your dog and to avoid the infection progressing. Is your dog at risk for impetigo? Impetigo is commonly referred to as puppy impetigo because it is most commonly found in puppies. This infection typically appears on their baby soft bellies and other exposed skin spaces such as the armpit area and groin. Due to puppies’ immature skin that has not yet fully developed, they are more susceptible to infections. The skin is constantly covered in bacteria, but a puppy is more likely to have an unhealthy bacterial imbalance, leading to an impetigo outbreak. Although there are many potential causes that can increase the likelihood of your dog contracting impetigo, another is a weakened immune system. Since puppies have not yet been exposed to many diseases and infections, their immune systems have not yet been toughened up by the big bad world. 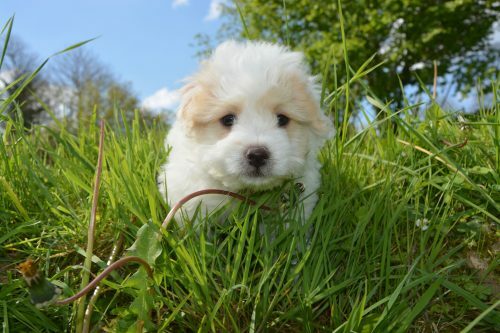 Overall, puppies’ young bodies, both internally and externally, are not as strong as those of their adult counterparts and therefore, they have a much higher chance of coming down with a case of puppy impetigo. In less common cases, adult dogs can also be affected by this type of infection. If an adult dog has impetigo, there is most likely another health factor that has caused the infection to take hold. For example, a food or environmental allergy could be causing the impetigo in an adult dog. Similarly, a hormonal imbalance, a parasite or another disease could be the culprit behind the impetigo in your adult dog. However, generally speaking, it is much more likely that a dog that has not yet reached maturity will be impacted by impetigo. How can I tell if my dog has impetigo? Impetigo makes an appearance on dogs’ skin in a few forms. It almost always crops up where the skin is not protected by fur and the skin is exposed. These areas include the belly, the folds between the legs and body (similar to an armpit), and the groin. Depending on your dog’s build and coat, it may appear in more or less areas. When giving your dog one of his beloved belly rubs, there are a few symptoms you can keep an eye out for to see if he is being impacted by impetigo. The most apparent symptom is acne-looking bumps on your dog’s skin. This “acne” may also be accompanied by a red, irritated rash. In addition to postulates that look like pimples, more serious pus filled blisters may also appear. Sometimes, pimples and blisters do not form on the skin, and instead you will notice scaly, crusty looking patches. If the impetigo has gotten to the point where it is extremely irritating the skin, your dog might experience hair loss in the spaces where the impetigo has spread. When it progresses to this point, your dog may even exhibit behavioral changes such as depression due to the discomfort caused by the impetigo. In cases that have not progressed as far, the skin may simply appear inflamed and irritated in clusters. Essentially, any sign of irritation such as a rash or pimple may be an indicator of impetigo. 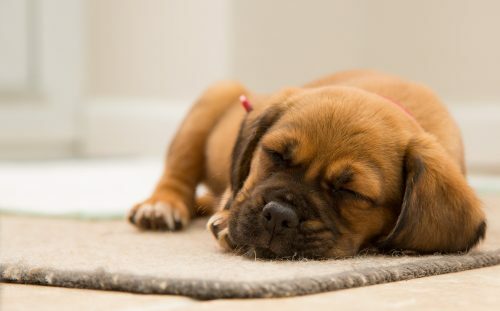 If your puppy or dog is experiencing any of these symptoms, they are also most likely experiencing a great amount of discomfort. Dogs do not understand that when you itch something it, usually makes it even itchier. Therefore, they will lick, scratch, and bite at the infected areas. This can cause the side effects to worsen and sometimes lead to another infection due to abrasions on the skin from excessive scratching. Additionally, the pimples and blisters can be filled with pus, and when a blister bursts, it will become more painful. Prevent your dog from injuring himself by treating the impetigo before he further irritates his skin. Unfortunately, it is not always apparent what causes impetigo in dogs. There are a number of potential factors to consider, but much to everyone’s dismay, there is not always one simple thing you can remove from your pup’s environment to eliminate the source of the impetigo. If your dog has impetigo, the first thing to check is his living environment. More times than not, an unsanitary living space is what triggers the bacterial imbalance, leading to an outbreak of impetigo. Check your dog’s bedding, crate, and other places that he frequents to ensure that it is cleanly. If not, thoroughly wash all spaces before allowing your dog to go back to that location. If you recently adopted or purchased your dog and notice impetigo, this may be a result of his previous living condition. 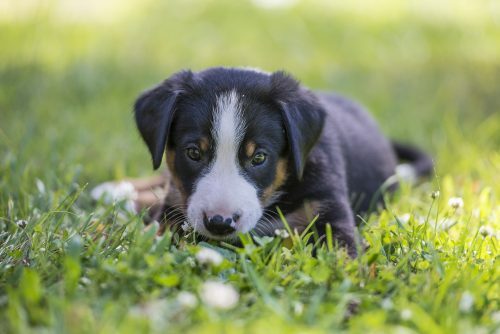 In this case, simply ensure that the space that you are providing your new pup with is sanitary, and seek veterinary advice in regards to how to treat the current case of impetigo. Another potential cause of impetigo is a parasite such as a flea or tick. These pesky creatures not only are the culprits behind tiny, itchy bites, but they can also carry diseases that they pick up from other animals. If your dog has already been exposed to the parasite, you should seek veterinary treatment. However, moving forward, you should avoid further outbreaks by trying to eliminate fleas and ticks from your puppy’s life. Even if your dog has not been exposed to impetigo, taking preventative steps to keep parasites away can never hurt. There are a variety of methods to warding off fleas and ticks. The most common is with a topical application of a flea and tick medication. With these medications, you simply open the container and apply the serum between the shoulder blades of your pup or as otherwise directed on the instructions. These medications typically last a month or two and must be reapplied to maintain their potency. Another topical solution is to purchase a flea and tick collar. Although these are not always as impactful as the medication, the collars help to ward off unwanted visitors. Alternatively, some companies make chewable tablets that can help kill ticks and fleas. While there are plenty of brands and forms of medication that you can provide your pooch with, one of the most important steps is simply keeping your space bug free. This includes vacuuming and washing bedding, furniture and carpets regularly. There are even medicated powders that you can sprinkle on the carpet before vacuuming to help in your fight against fleas. Regardless of what method you select, keeping parasites out of your pup’s living environment is key to keeping away impetigo. If your dog is still an adorable little puppy, the impetigo may be simply stemming from an underdeveloped immune system. Puppies are still growing, and therefore their local immunity is not as strong as one in an adult dog. Due to their youthful bodies, a bacterial imbalance can develop, particularly on the areas not protected by hair. This imbalance is what leads to the development of impetigo. If this is the case, simply seek veterinary advice and you pup should outgrow this issue with age. 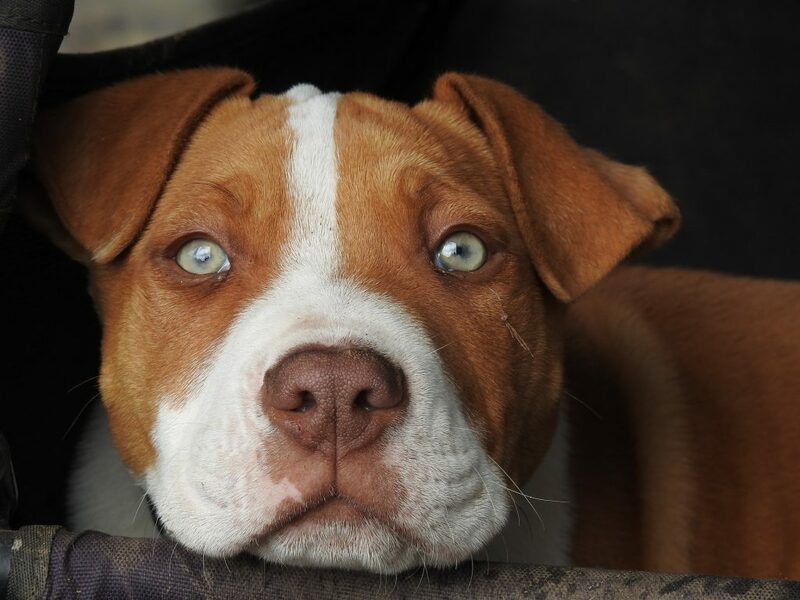 In adult dogs and sometimes in puppies, it is harder to detect the root of the problem. A weakened immune system, another skin infection or an allergy may also be at the source of this irritating infection. If a compromised immune system or another infection is not present, you can try changing your dog’s diet to see if it helps clear the allergy. 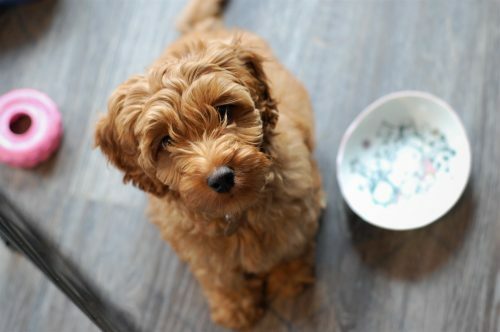 In this case, you should feed your dog natural, organic food that he has never had before and that does not have any overlapping ingredients with what you are currently feeding him. How is impetigo in dogs treated? If you have determined that your four-legged friend has this disease, now you must figure out how to treat impetigo in dogs. The most surefire way to eliminate the bacterial infection is to consult a veterinarian. Although you may be able to identify the symptoms, treatment can vary from case to case. Veterinarians often like to conduct tests to rule out ringworm and mange mites before treating your pooch for impetigo. In addition, a skin cytology will be conducted to analyze the microorganism and see if it is impetigo. Once your veterinarian has identified the infection as impetigo, he or she can advise you on the next steps for treatment. When the case is mild, your vet may simply ask you to keep a watchful eye on the infection to ensure that it does not progress. This treatment method is most common if your dog is right on the verge of moving from puppyhood to being an adult dog. Impetigo can go away on its own, so if your vet feels that this is the case, there is no need for antibiotics. If your plan is to let the infection run its course, then your vet can suggest an anti-itch cream to alleviate irritation. On the other hand, your vet may not feel comfortable letting the impetigo go away on its own. A topical antibiotic alongside an antiseptic wash will most likely be prescribed. The topical antibiotic will be an ointment or cream that you can apply to the infected areas, and the antiseptic wash will be a shampoo to help clear the infection. If your veterinarian does not feel that the topical antibiotic and antiseptic wash will be strong enough to clear the impetigo, antibiotics will be prescribed. Antibiotics can be received in the form of injections or through oral doses. Although antibiotics are a strong medication, impetigo can be a tough infection to get rid of and may need a couple rounds of antibiotics. Strictly following the treatment steps are essential in eliminating this uncomfortable infection. Will my dog recover from impetigo? Even though impetigo can form unsightly blisters and rashes on the skin, it is not a life threatening infection. Sometimes impetigo can be stubborn and tricky to get rid of, but with proper treatment, it should not be a persistent problem. Although it is not an imminent threat to your pup’s life, it does compromise his comfort. Your dog will bite, scratch, and lick the infected area, worsening the problem. If the impetigo is left untreated, then it may become a more serious issue. Similarly, if you are unable to identify that your dog has impetigo, you will not be able to eliminate the cause from your pup’s life. The cleanliness of his environment, a food allergy, or another infection may be behind the impetigo outbreak, which are all detrimental to your dog’s health. Getting to the bottom of the problem will not only help get rid of the impetigo, but it will improve the overall quality of your dog’s life. No one wants to live with inflamed rashes, pimples, blisters and scaly skin, and your dog is no exception. Impetigo is an irritating canine skin infection that no pup should have to endure, and luckily, with the help of you and your veterinarian, you can determine the cause and get your pup on the road to recovery. “Puppy Impetigo in Dogs – Symptoms, Causes, Diagnosis, Treatment, Recovery, Management, Cost.” WagWalking, 4 Feb. 2017, Accessed 22 Aug. 2017. www.wagwalking.com/condition/puppy-impetigo. “Impetigo in Dogs.” VetInfo, Accessed 22 Aug. 2017. www.vetinfo.com/impetigo-in-dogs.html. “Symptoms of Impetigo in Dogs.” VetInfo, Accessed 22 Aug. 2017. www.vetinfo.com/symptoms-of-impetigo-in-dogs.html. “Puppy Impetigo (Puppy Pyoderma, Juvenile Pustular Dermatitis).” PetCoach, Accessed 22 Aug. 2017. www.petcoach.co/article/puppy-impetigo-puppy-pyoderma-juvenile-pustular-dermatitis/. “What You Need to Know About Pyoderma in Dogs and Cats.” Vetstreet, Accessed 22 Aug. 2017. www.vetstreet.com/care/pyoderma-in-dogs-and-cats.